ARMENIAN MIDIA DOLMA - STUFFED MUSSEL DOLMA. Made with fresh or canned mussels. An extraordinary appetizer. Dolma means stuffed or filled. These are filled mussels with rice, fruit, nuts & aromatics. What's to want? •  Open mussels with a knife and flush with fresh water. •  Sautè the onions in the olive oil until translucent to golden. 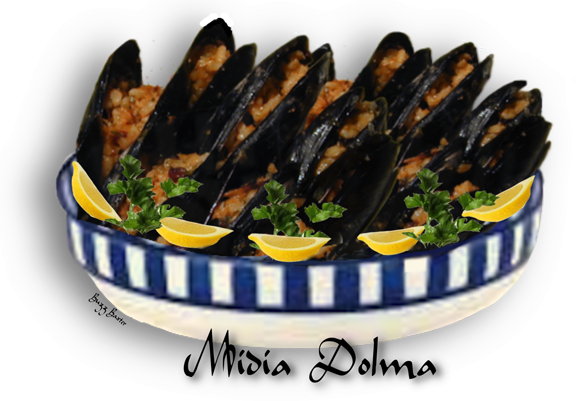 •  Add the rest of the ingredients (Not the mussels),  and mix well. add water and cover with a plate. •  Bake in a 300º degree oven for 1 1/2 hours. These can be served hot,  at room temperature,  or chilled. **NOTE:  This mixture can also be used to stuff cabbage or grape leaves.